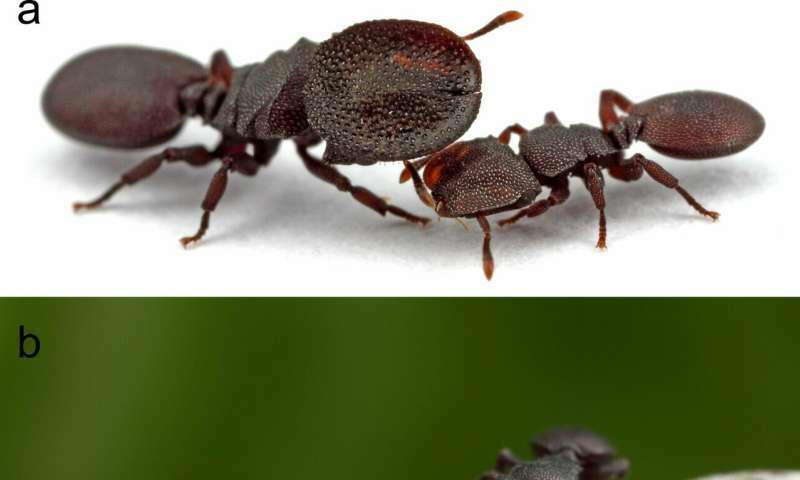 The neurobiology of turtle ants differs significantly according to their specialized role within the colony, according to a study published March 27, 2019 in the open-access journal PLOS ONE by Darcy Greer Gordon from Boston University and colleagues. Turtle ant (Cephalotes varians) colonies are socially organized into multiple castes which are behaviorally and phenotypically different. These include sterile minor workers (who perform the majority of colony tasks), soldiers (who use their remarkable plate-shaped heads to defend colony entrances, acting as "living doors"), and gynes (reproductively-capable females that share the same head shape as soldiers and use it for defense early in colony foundation). In this study, the authors investigated whether turtle ant neurobiology is caste-specific. They collected both queened colonies and colony fragments (comprised only of winged gynes, soldiers, and workers) from red mangrove stands in the Florida Keys in March 2015. After taking head measurements from their minor worker, soldier, and winged gyne samples, the authors dissected out the brains, imaged them, and analyzed the brain structures. Gynes had a significantly larger overall brain volume than soldiers and minor workers, whose brain volumes were similar. Gynes and soldiers also tended to have significantly larger visual-processing regions than minor workers. Compared with gynes and soldiers, minor worker brains were larger in regions generally associated with processing capabilities, which may aid the workers in performing their diverse tasks. Examination of synaptic structure in regions associated with cognitive processing revealed differences across castes, with minors having fewer and larger synaptic complexes than both gynes and soldiers, which did not differ from each other. The intermediate appearance of soldier brains indicates they share both worker and gyne features, which may offer clues to their evolutionary origin. The authors note that a potential limitation of the study is that they only sampled virgin gynes; gyne brain structure may change with mating and colony foundation, and further analyses could examine this effect. Nonetheless, these results indicate that turtle ant neurobiology differs by caste, and in future might provide insight into how these castes evolved. Gordon adds: "Ant societies show extraordinary division of labor where only queens reproduce, and sterile workers, sometimes strikingly different in size and shape, specialize on tasks such as nursing, foraging, housekeeping, and defense. In the turtle ant, Cephalotes varians, differences in the size and structure of the brain, which are detected using computational neuroimaging, reflect task specializations across queens, soldiers, and workers."